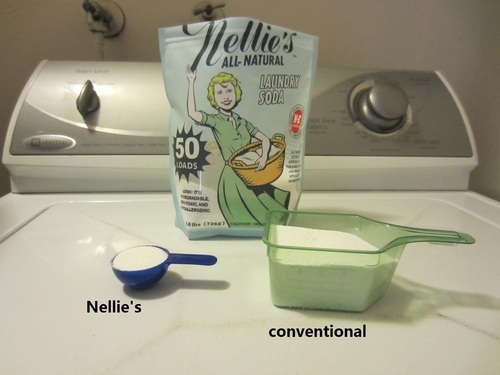 Nellie's laundry soap is an all-natural powdered product designed to wash clothes. Many people also use it to wash their cloth diapers. The product is hypoallergenic, and claims to rinse away residue free, things that are very important to people with sensitive skin. 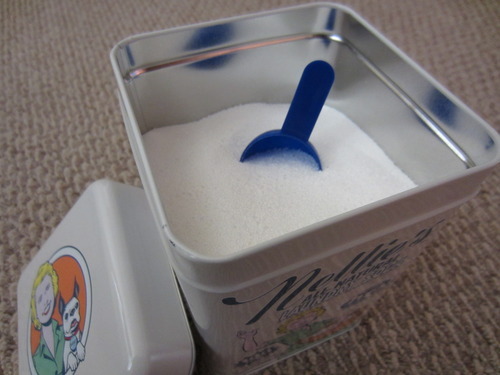 The product is also quite concentrated, so compared with many other powders you don't have to add much to each load. This company has a whole line of natural laundry products actually, including not only the detergent but also oxygen brightener and dryer balls. I would love to hear from people who've used any of these products sharing how you liked it, good or bad, and your experiences with it. You can share your review here. Further, you can check out more eco-friendly laundry detergent brands available here, along with reviews of them, where available. 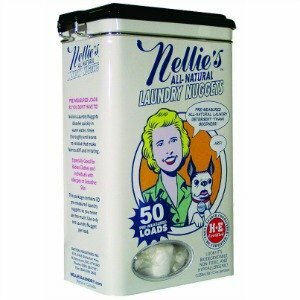 With great reserve I have switched detergents to Nellie's Detergent from standard front-loader national brand. 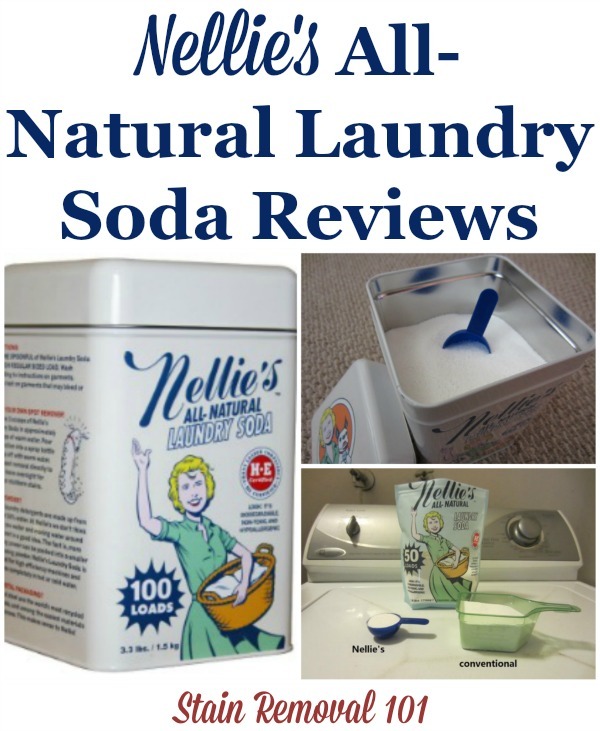 I am flabbergasted by how completely well the product works---my laundry is extremely greasy/dirty/smelly due to maintenance jobs, and Nellie's actually cleans superbly and efficiently! What a surprise! One of my grown children is allergic to numerous scents, and Nellie's has come to our rescue! It is also wonderful for baby clothes, and elders who can't stomach heavy scented cleaners. I can totally endorse this product. I started to use Nellies Powder almost two years ago, but since it is not always available I had to buy other brands when I needed to. I was always happy when I found Nellies, and have now developed the habit of buying a few refill bags at a time, or alternatively I will buy the nuggets, which is a great convenience. 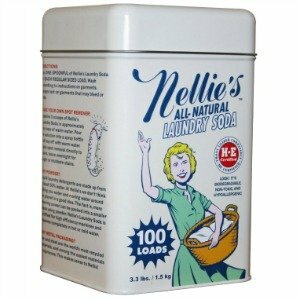 Nellies does not boast a perfume, like many other laundry detergents, thus people looking for a fresh smell may not like it. I don't like perfumes so this works for me. What I do appreciate is that the laundry does smell clean. When I started using it I mainly used it for our dog's bedding, our bedding and towels. They all came out clean and fluffy, even though I do not use softener on any of these items. I then tested it on clothing, cautiously at first. Now I use it on everything, and even my very special delicates. No residue, no fading and no lint on clothing. My HE front loader needs less cleaning, my laundry is bright and does not fade. I do not have issues with badly stained or soiled laundry. I do however have to treat oily/fatty stains (mostly because I am messy in the kitchen). I only use cold water for my laundry, maybe warmer water will get the stains out better, not sure. Love love Nellies. It is environmentally friendly. That fact works for my conscience. It is gentle on our skin, and gets the job done. It is also cost effective. My laundry costs have dropped tremendously. Everyone I have spoken to that does use it will not use anything else again. I would like to see it be available in more stores, and not always have to go out of my way just for one product. Thanks so much for sharing this really informative review Angelika. Has anyone else used this brand? If so, I'd love to hear how it has worked for you too. You can share your review here and I'll add it to the page. I use Nellie's and absolutely love it and won't use anything else. I used "Free and Clear" detergents for several years and I believe they have been reformulated and now make my skin itchy the same as regular detergents. It's been a 4 month battle trying to discover the culprit of my condition. No rash, no bites, no hives, no flaking, no dry skin. Just itchy, much like how regular detergents used to when I used them years ago. After having the same itch with 3 different "Free & Clear" and "hypo-allergenic" detergents, I crossed allergic dermatitis due to detergent off the list. Then my dryer broke down and I had to visit the laundromat for a couple weeks until fixed. An eco-mat nearby provides complementary Nellie's for each load, so I thought I would take advantage. For those two weeks, I had no more itching at night and eventually it ceased. I fixed the dryer and went back to the "Free and Clear" I had at home. MORE ITCHING! It was detergent all along. The Nellie's is genuinely hypo-allergenic and my sheets were noticeably softer. In fact I now realize how abrasive my sheets felt before compared to after using Nellie's. I'm switching permanently to Nellie's. The Eco-mat also sells full tins and will refill them for you to prevent waste. It's also cheaper than a new container from Amazon or Whole Foods. I have been using Nellie's for the past couple of years. I like the cost, small quantity needed and the fact that it has no scent. It also totally rinses out. I have noticed after awhile it does fade the darks a bit. I have now mixed it with Molly's, a similar product. Mollies does not seem as harsh and has a light, lemon fragrance. Both products are available at HSN. I started using Nellie's three months ago without relief from the hives and itching. I've tried other detergents that were supposed to be hypoallergenic without success. I'm 64 years old and suddenly allergic and eating benadryl 6 times a day with 3 other antihistamines. Anyone have suggestions? I've washed my laundry 5-6 times in water and white vinegar and still react to items washed over and over. Nellie's is a life saver for people with Eczema! My young daughter has severe Eczema which was a constant battle while trying to find a laundry detergent that wouldn't cause her Eczema to constantly flair up. I saw Nellie's on HSN and decided to try it and I am SOOO glad I did. It has been so wonderful and truly an answer to my prayers. My clothes smell so clean with this detergent that is all natural. It works! My husband is also in law enforcement and has to wear moisture wicking under shirts like Under Amour under his bullet proof vest. These shirts would get an awful smell and since they are constructed of all man made fibers, I could NOT get the smell out no matter WHAT I tried. Well, to my amazement, Nellie's did the trick! I was also happy to find that Cosco now offers the 1100 Load HUGE bucket for $99. That is the best price I've found per load. I have been using Nellies for a couple of weeks now. It is not removing BO or body perfumes. Not sure what I am doing wrong. I double up on the soap, no change. I love the fact this is an eco-friendly product and does clean well. My only concern is that my dark clothes (mostly black) seem to be fading -- I've stopped using the brightener on them. I'm not loving the harsh feel of the clothes when they come out of the washer. Wondering if anyone uses something else in the wash for this. Also, I'm using the wool dryer balls and they are fantastic.